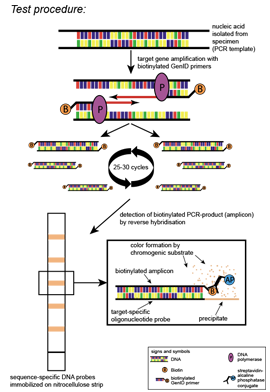 AID molecular genetic diagnostic kits are based on reverse hybridization of DNA. DNA amplification by polymerase chain reaction (PCR) before DNA characterization enables high sensitivity. Minimal amounts of DNA are sufficient for analysis. Strips can be evaluated by AID Immunblot/Genoblot-Scanning System quick and easily.